^ Alvarez-Buylla ER, Chaos A, Aldana M, Benítez M, Cortes-Poza Y, Espinosa-Soto C, Hartasánchez DA, Lotto RB, Malkin D, Escalera Santos GJ, Padilla-Longoria P (3 November 2008). "Floral Morphogenesis: Stochastic Explorations of a Gene Network Epigenetic Landscape". PLoS ONE. 3 (11): e3626. Bibcode:2008PLoSO...3.3626A. doi:10.1371/journal.pone.0003626. PMC 2572848. PMID 18978941. ^ a b Rabajante JF, Babierra AL (30 January 2015). "Branching and oscillations in the epigenetic landscape of cell-fate determination". Progress in Biophysics and Molecular Biology. 117 (2–3): 240–49. doi:10.1016/j.pbiomolbio.2015.01.006. PMID 25641423. ^ Holliday R (30 January 1990). "DNA Methylation and Epigenetic Inheritance". Philosophical Transactions of the Royal Society of London. Series B, Biological Sciences. 326 (1235): 329–38. Bibcode:1990RSPTB.326..329H. doi:10.1098/rstb.1990.0015. ^ O'Hagan HM, Mohammad HP, Baylin SB (2008). Lee JT (ed.). "Double strand breaks can initiate gene silencing and SIRT1-dependent onset of DNA methylation in an exogenous promoter CpG island". PLoS Genet. 4 (8): e1000155. doi:10.1371/journal.pgen.1000155. PMC 2491723. PMID 18704159. ^ Tabish AM, Poels K, Hoet P, Godderis L (2012). Chiariotti L (ed.). "Epigenetic factors in cancer risk: effect of chemical carcinogens on global DNA methylation pattern in human TK6 cells". PLoS ONE. 7 (4): e34674. Bibcode:2012PLoSO...734674T. doi:10.1371/journal.pone.0034674. PMC 3324488. PMID 22509344. ^ Burdge GC, Hoile SP, Uller T, Thomas NA, Gluckman PD, Hanson MA, Lillycrop KA (2011). Imhof A (ed.). "Progressive, transgenerational changes in offspring phenotype and epigenotype following nutritional transition". PLoS ONE. 6 (11): e28282. Bibcode:2011PLoSO...628282B. doi:10.1371/journal.pone.0028282. PMC 3227644. PMID 22140567. ^ Sneppen K, Micheelsen MA, Dodd IB (15 April 2008). 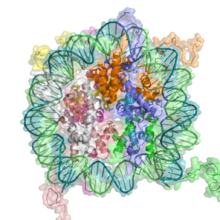 "Ultrasensitive gene regulation by positive feedback loops in nucleosome modification". Molecular Systems Biology. 4 (1): 182. doi:10.1038/msb.2008.21. PMC 2387233. PMID 18414483. Retrieved 5 May 2014. ^ Lluch-Senar M, Luong K, Lloréns-Rico V, Delgado J, Fang G, Spittle K, Clark TA, Schadt E, Turner SW, Korlach J, Serrano L (2013). Richardson PM (ed.). 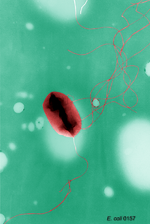 "Comprehensive Methylome Characterization of Mycoplasma genitalium and Mycoplasma pneumoniae at Single-Base Resolution". PLoS Genetics. 9 (1): e1003191. doi:10.1371/journal.pgen.1003191. PMC 3536716. PMID 23300489. 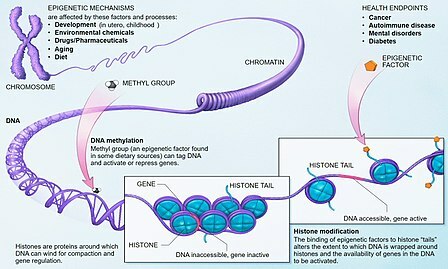 ^ "Epigenetics & Inheritance". learn.genetics.utah.edu. Retrieved 17 April 2019.